Siliguri: Decks have been cleared to build an alternative road to Sikkim which is now linked with the rest of India though NH10 that is out of bounds for vehicles during the monsoon because of landslides. The 250km new road that originates from NH31C near Bagrakote and ends at Gangtok is strategically important, especially in the wake of the Indian army's standoff with Chinese military at Doklam near the Sikkim-Bhutan-Tibet tri-junction. The National Highway & Infrastructure Development Corporation Limited (NHIDCL) has been tasked with the construction which will begin this year. "The recent standoff between the Indian and the Chinese armies at Doklam has again proved how strategically important Sikkim is for India. Hence, an alternative highway along the hilly terrains is essential for security purposes. Also, there are a number of landslide-prone stretches along NH10, which disrupt traffic, particularly during the monsoon. 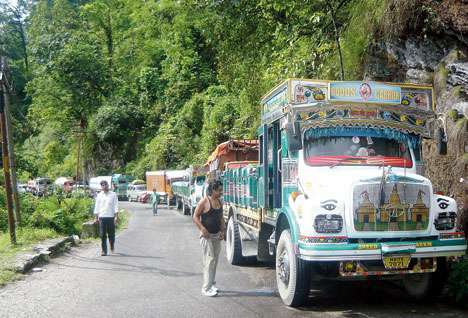 The alternative highway has been a longstanding demand of Sikkim residents," said a former bureaucrat of the Himalayan state. The project was approved by the Centre in 2015. NH10 starts from Sevoke near Siliguri and ends in Gangtok via Melli and Rangpo. "The NHIDCL has already obtained some of the clearances and engaged contractors and consultants to start the work on the Bengal side. The civil work has started along a stretch in Sikkim. Preparations for the project report are in progress with regard to some other stretches," said a source. The alternative highway will pass through Algarah and Lava to reach Rishi (on the Bengal-Sikkim border) from where it would connect Rhenock, Rorathang, Pakyong and Ranipool before terminating in Gangtok. The NHIDCL has taken up two other important projects which will facilitate the movement of vehicles in north Bengal and Sikkim. One is a 1.8km-long viaduct at Rangpo, the Sikkim town that borders Bengal. Although there is a bailey bridge over the Rangpo river on the border, vehicles are stuck on either side for long. "That is why a viaduct (a bridge-like structure with small spans) has been planned. It can help in smooth movement of traffic, particularly heavy vehicles," a source said. A sum of Rs 133.49 crore has been allocated for the project and civil works have begun on the site. The NHIDCL will also build a 1.5km-long bridge over the Mechi river that separates India and Nepal. In August last year, the Union cabinet has approved the MoU signed with Nepal and Rs 158.65 crore has been allocated for the project. The bridge will connect Panitanki on the Indian side (located 40km from here) with Kakarvitta in Nepal.